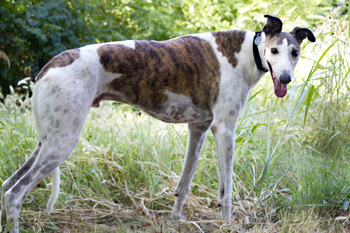 Luke, fka Warrior, aka C Ya War Chief, is a handsome 10-year-old white & brindle male born July 5, 2005. His sire is Kiowa Sweet Trey and his dam is Fuzzys Apache making his grandsire Wigwam Wag. 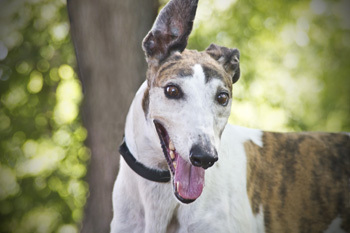 Luke has no races to his credit on Greyhound-data.com and came to GALT from another adoption group. Luke was successfully treated for heartworm back in 2011. Luke was in an adoptive home for 3 years, but his owner has passed away so he's looking for a new forever home. Luke is a big, sweet, very affectionate boy with fabulous house manners. He can be an only dog, but also gets along with others. He has a history of corns, but has responded well to treatment. He also has Chronic Ulcerative Paradental Stomatitis (CUPS), which is a disease caused from a hypersensitivity to bacteria contained within the plaque which coats the teeth. Luke is not cat tolerant at this time, and should also not live with very small dogs. Luke is the most regal looking boy in the tribe! 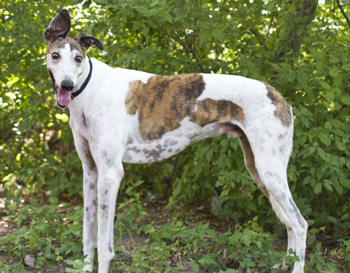 His noble looks are enhanced by a stunning Roman nose and brindle spots. He is very affectionate and gets along well with other dogs but likes to be first to go out or come back in in a spunky kind of way. His house manners are great. He's never had a potty accident, likes his crate, and doesn't counter surf. At night he sleeps in my bedroom with the other dogs and sleeps through the night even if one of the other dogs wants to go out. Just the suggestion of a walk gets him all excited, but he settles down and walks well on his leash. He's quite strong and will try to take advantage of an opening door, but we are working on that. Luke is a fun-loving boy who likes to play and gnaw on a good bone. He is learning to run around the backyard with the other dogs and loves it! He thinks riding in a car is fabulous and he'll wait to be told he can come out. He's not a barker unless he sees a squirrel or thinks he's been outside too long - then he'll give 2 loud woofs. This tall, classic looking grey is one-of-a-kind!